EOS is showing signs of a recovery after a recent drop toward $3.35. The market is now trading around $3.59 after a 2% price increase over the past 24 hours. This comes off following a news report about a hacker had managed to move over 2.09 million EOS coins, approximately $7.7 million equivalent value. The hacker was able to obtain access after an alleged failed update by an EOS Block Producer. He went on to transfer the stolen funds onto his Huobi exchange account. However, the security team at Huobi had managed to detect the unusual EOS deposit and noticed the funds coming from a blacklisted EOS account. The exchange security team then proceeded to freeze the hackers account and its funds on the exchange. 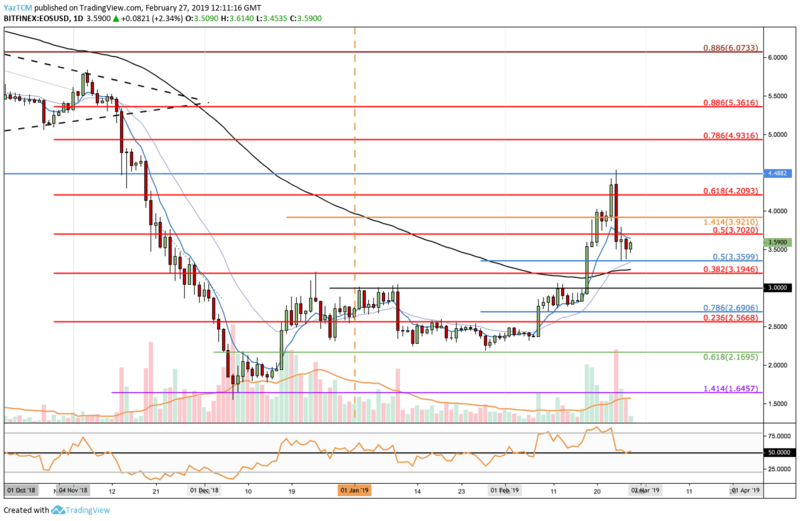 Since our last EOS analysis, we can see that the coin had continued to surge even higher into the marked resistance level at $4.48. After the price reached the above resistance, the market rolled over and rejected into the short term .5 Fibonacci Retracement support level at $3.35 (marked in blue). From above: If the buyers break above $3.70 the nearest higher resistance lies at $4.00. Further resistance above $4.00 is located at the $48 level followed by the $4.93 (bearish .786 Fib) and $5.36 (bearish .886 Fib) levels. From below: If the sellers break below $3.59, the nearest support lies at $3.20 and $3.00. The RSI had held the 50 level indicating indecision within the EOS trading. 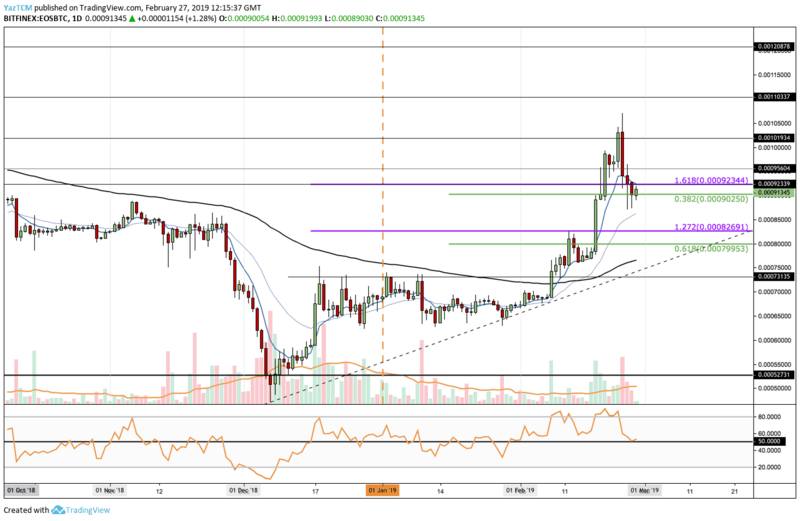 EOS has also surged against BTC as price action had reached a high of 0.00105 BTC before stalling. The market has since fallen slightly and is trading at the 0.000902 BTC support level of the short term .382 Fibonacci Retracement level (marked in green). From below: The nearest support lies at 0.00085 BTC and 0.008270 BTC. If the sellers push the market further lower, more support is then located at 0.0007995 BTC (.618 Fib) and then at the ascending trend line (marked as a dashed line). From above: The nearest resistance lies at 0.000956 BTC, followed by 0.00105 BTC. If the buyers break above 0.00105 BTC higher resistance lies at 0.001103 BTC and 0.001208 BTC. The RSI is also trading at the 50 zones but has started to bounce higher, which could turn into a bullish sign.